There is a history of celebrations in most of the indigenous peoples of Latin America, the Aztec, Mexica, Maya, Purépecha, Nahua and Totonaca ethnic groups. The rituals that celebrate the life of the ancestors have been carried out in these civilizations for at least three thousand years. In the pre-Hispanic era, it was common to keep the skulls as trophies and to show them during the rituals that symbolized death and rebirth. The idea of death in pre-Hispanic cultures in Latin America is conceived as an event that involves a change that should not be understood as the end of a cycle, but as the continuation of it. Moreover, it keeps a harmonic (cyclical) relationship with life, since it is the origin and consequence of it. Throughout Latin America, the native peoples celebrate their dead not with pain, but understanding death as one more stage of life. In this way, from Mexico to Chile there are dances, chicha, garlands with flowers and at all the tables an empty place is left to wait for the arrival of the deceased loved one who during “Día de los Muertos” will be with his beloved ones. The pre-Hispanic burials were accompanied by offerings that contained two types of objects: those that, in life, had been used by the deceased, and those that he might need in his transit to the underworld. In this way, the elaboration of funerary objects was very varied: musical instruments of clay, such as ocarinas, flutes, kettledrums and rattles in the shape of skulls; sculptures that represented the mortuary gods, skulls of different materials (stone, jade, crystal), braziers, incense burners and urns. “The expansion of Catholicism in Latin America re-signified the cults to the dead, from Mexico to the highlands of Argentina, and many of these rituals happened to be held on November 1, All Saints Day, or November 2, All Souls Day, keeping the original characteristics conjugated with Catholic beliefs. “These dates are part of the construction of new identities where the indigenous past coexists, the European past and a good present of ours “, explains the anthropologist Fernando Pepe. For our native peoples “life is not linear, it is not that we are born, grow and die but it is a cycle: The body returns to the pacha (earth) but the spirit, energy, soul or newen, as the Mapuches call it, goes to another level and on the day of the soul a passage opens and they visit us again. In contrast to the European tradition, which tinges with sadness and pain on this day, where the living will bring flowers to the dead, the ancestral custom of our indigenous peoples gives a strong color and symbolic charge to this day, no tears among the original peoples, there is joy and celebration: death and life, life and death are complementary processes. In this way the Collas, Quechuas, Mapuches, Querandí­es, and Diaguitas communities prepare their best meals and drink their favorite drinks to honor their dead who, at some point on this day, will find a way to return to their homes, visiting friends, loved ones and family. The Day of the Dead is celebrated in many different ways depending on the origin and traditions of each country and community. In Latin America, this day represents in many countries a holiday full of colors and cheerful motifs that refer to death, but from another perspective. With the heritage of indigenous culture, Latin Americans who celebrate this day take the opportunity to meet spiritually with their beloved ancestors and thus celebrate life. The best-known celebration of the “Dí­a de los Muertos” in the United States is that of Mexico because of its proximity to the US. 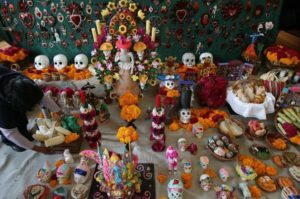 UNESCO has declared the Mexican Indigenous festivity dedicated to the dead to be An Intangible Cultural Heritage of Humanity. Celebrations of the Day of the Dead take place in major cities across the U.S., especially in San Antonio, Los Angeles, Chicago, Phoenix and in the small towns in these areas. In Bolivia, the ceremony begins at 12:00 noon on November 1 until noon on November 2 (holiday). It is believed that “on November 1 at noon the ajayus return from their mountains to live together for 24 hours with their family and friends.” This ritual consists in the donation of offerings to the souls, by means of “an altar or table also called apxata that is adorned with flowers, candles, canes, fruits, drinks and sweets, in addition to other elements”. One of the elements that forms part of the altar is the “tantawawa”. The tantawawa is a cake of approximately 50 cm “with human form and a colorful face that is modeled in stucco and that represents the deceased”. The ladder of bread is another component of the apxata that symbolizes the ascent of souls to heaven. A very common activity in those dates is the traditional visit to the cemetery, where people come together to receive the souls of their dead among offerings, prayers and music. In the event that the deceased has died the same year, a table or altar is made. A very popular custom is “to make pray”, it is about hiring someone (yatiri, musician or rezador) to raise a prayer or dedicate a song to the deceased. In Brazil, the celebration similar to the Day of the Dead (as we know it in Mexico and most of Latin America) is the Day of Commemoration of the Faithful Dead. This celebration is Christian tradition brought by the Portuguese, the European country that conquered Brazil. There was not a large civilization and they did not have large and recognized celebrations. The day of the deceased or Commemoration of the Faithful Dead is celebrated on November 2. On this day the family members bring flowers to the dead. It is not customary to bring them food. On this day the priests say three funeral masses except when November 2 falls on a Sunday. Many people pray this day to the souls that are in purgatory so they can go out. In Brazil, they don’t make altars, but the closest people bring them flowers representing all the love and respect they had for the deceased. Some people also take some things that belonged to the deceased and put them in their grave. Many people in Brazil visit the cemeteries to visit the graves of their family and friends. In Sao Paulo, the largest city in Brazil, almost two million people visit the municipal cemeteries, while in Rio de Janeiro the figure is even higher at 2.5 million people. Mictecací­huatl, the Lady of Death, walks among the living through the streets of the town of Tonacatepeque, El Salvador, where the night of each November 1 is celebrated as the Day of Calabiuza in her honor and that of her husband, Mictlantecuhtli, and in tribute to the deceased. The night is filled with the undead with costumes representative of the mythology of El Salvador, who walk to the sounds of their own canticles, whose lyrics – “Angels are from heaven and we are asking for a spoil for our way mino mino” – is repeated incessantly between cries and cries that represent pain for the absent. The Day of the Faithful Dead is one of the dates of great importance for Salvadorans who visit the cemeteries to remember their loved ones. Also, they take advantage of this day to celebrate the lives of those who are still alive. There are five traditions of Salvadorans to remember the faithful departed. Every year the families will fill with flowers the graves of their loved ones who have died. For many people in the community it is very painful not knowing where the bodies are of their relatives killed by the war and they feel a great pain because they cannot fill with flowers their tombs. Crowns and arrangements are sold, natural and artificial flowers, as well as other materials that serve to decorate the tombs, with this activity the cemeteries end up full of colo. The family takes paint, brushes, brooms among other items to clean and renew the tombs and niches of their loved ones. There are many musical groups where many people request the favorite songs of their loved ones when they were alive. The typical food is also tasted on this day. Pupusas de chipilín, tamales, yuca frita or hojuelas with honey of panelas. It is also customary to make ayote with honey. In most of the cemeteries, special masses or cults are celebrated to remember the loved ones on this date. Bob Carlsen can’t give up his Maryknoll magazine collection. Hundreds of issues sit in a box in his basement, containing thousands of stories he read growing up in Queens and on Long Island in the 1960s and 1970s. Back then, the print publication was a staple of Catholic parishes and households, and its vivid content brought home the work of Maryknoll, featuring the missionary work of the Maryknoll Fathers and Brothers, the Maryknoll Sisters and later, the Maryknoll Lay Missioners (MKLM). It has been a pillar of the U.S. Catholic Church’s global mission for more than 100 years. “The magazine fascinated me,” Carlsen says. “It was like the intersection of National Geographic and [the Brooklyn diocesan newspaper] The Tablet. It showed priests and nuns traveling by donkey and motorcycle to visit communities in the Andes, working with tribes in Africa, and serving in remote parts of Asia. They became conversant in many tribal languages, allowing them to connect with the local people. Now, several decades after that enthusiastic response, Carlsen is on the board of directors of Maryknoll Lay Missioners. Serving alongside him is his good friend of 30 years, business associate, and fellow St. John’s Law School alumnus Mike Cammarota. Over the past eight years, the two have also lived the MKLM mission on short-term immersion and volunteer trips with the organization’s Friends Across Borders program to El Salvador, Bangladesh, Nepal, Bolivia, and, most recently, Tanzania. Like Carlsen, Cammarota is a Queens native who grew up in a Catholic family that encouraged faith-based volunteerism. After graduating from the law school, Cammarota started in IBM’s legal department, where he worked for 20 years. Every year he returned to St. John’s to connect with law students who had accepted positions at IBM. “In 1987, that was Bob Carlsen, and we hit it off immediately” he recalls. Carlsen’s work for IBM took him across the country and around the world. As senior counsel in IBM’s software business, he relocated to Bangalore, India, where he spent two years advising the company’s software labs in the region. “Living as an expat in India turned into the greatest spiritual journey of my life,” he says. “I was with Hindus, Muslims, Jains, and others in a big, churning country that was just starting to feel its global presence. The Gandhi history and legacy, and the deep personal commitment to holiness I saw in so many Indians, strengthened my Catholic faith tremendously.” In his memoir, Sacred Dust on Crowded Streets: Conversations with India (Trafford, 2010) Carlsen deftly recounts his life-changing experiences in India. From left, Father Bill Vos, Bob Carlsen and Mike Cammarota on the shores of Lake Victoria during a Friends Across Borders trip to Tanzania. Eventually Carlsen left IBM for Accenture, a management consulting and professional services firm where he is now the director of legal services. The move reunited him professionally with Cammarota, who had already become Accenture’s managing director–senior director of legal services, global transactions. “The boys in the band were back together,” says Cammarota, expressing a warm camaraderie that carries over to their service with MKLM, including their most recent mission trip to Tanzania. Mike Cammarota playing flash cards with school children in Tanzania. 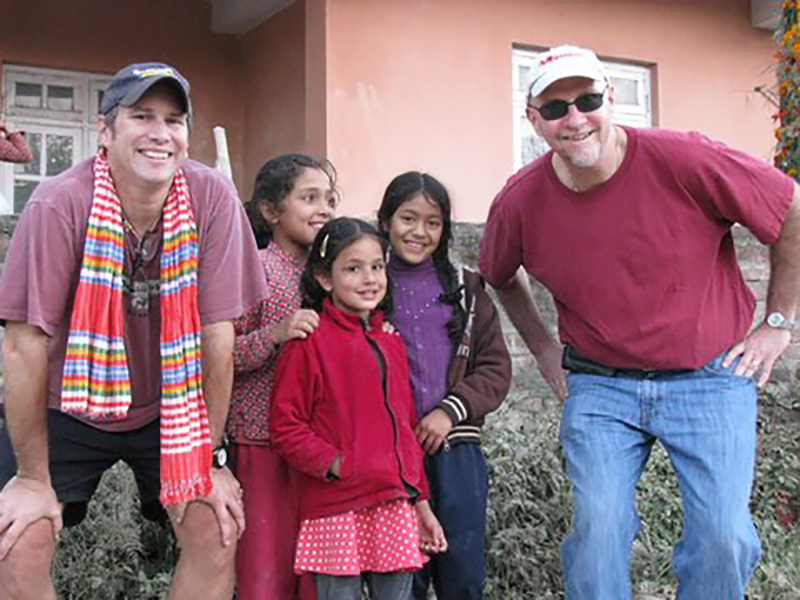 The insight that Cammarota and Carlsen gain on their lay missions around the world informs their stewardship on MKLM’s board of directors, which is now chaired by another St. John’s Law alumnus, Terry Miller, who is a returned Maryknoll Lay Missioner. Miller, who is senior international officer at Marquette University in Milwaukee, is equally delighted to work with Carlsen and Cammarota. His MKLM board leadership is rooted in an early desire to advocate for human rights and social justice. Looking to broaden his impact, Miller joined MKLM as a lay missioner in the rural Diocese of Linares, Chile. From 1988 to 1991, he worked with the families of individuals who were detained, disappeared, and tortured under General Augusto Pinochet’s brutal dictatorship. In the late 1980s, Terry Miller worked as a Maryknoll Lay Missioner on human rights cases in Chile. 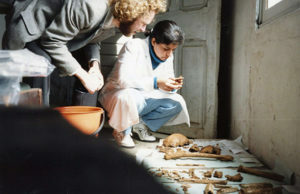 Here he examines bones from a mass grave of victims of the Pinochet dictatorship. “Among other duties, I assisted in the investigation and excavation of a mass grave where 17 victims of the repression had been secretly buried,” Miller says. “I also helped prepare Linares diocesan input for the National Commission for Truth and Reconciliation Report on human rights abuses during the dictatorship.” Miller then returned to the United States to head up the Maryknoll Justice and Peace Office (forerunner of the Maryknoll Office of Global Concerns) and to serve MKLM full time in different leadership capacities before starting his career in international studies and education. A year ago, he joined the board of directors to support MKLM’s global commitment to the poor. Excerpted with permission from an article in the Fall 2018 issue of St. John’s Law, the alumni magazine of the School of Law of St. John’s University in Queens, New York. David gives the thumbs up to his newly acquired hearing aid, as his mother, Doña Santusa, and Maryknoll Lay Missioner Filo Siles cheer him on. Maryknoll Lay Missioners in Bolivia use the 6 Rs to give the gift of hearing. Just this week, we found a hearing specialist who adapted one of the gently used, reusable hearing aids to meet David´s needs. He immediately learned to say “Mama.” Tears of joy flowed. Our prayers were answered. Collaboration made the difference. The arithmetic puzzle we could not solve, the writing we did to Sister Joan and the reuse we discovered for the hearing aids have become a miracle for David and his mother, Doña Santusa. We have two other young children scheduled to be fitted for the remaining pairs of hearing aids in the coming weeks. 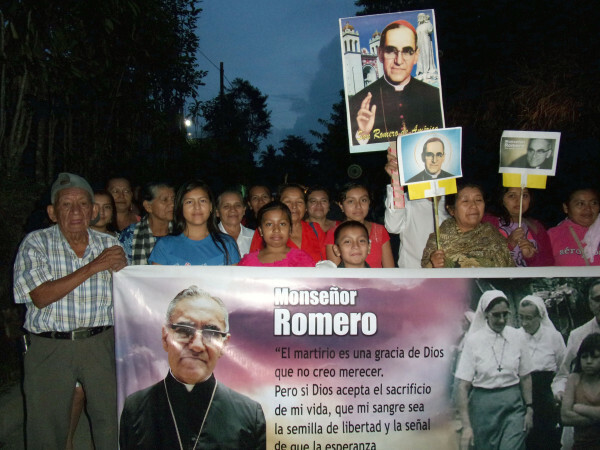 MONTE SAN JUAN, El Salvador—The canonization of Óscar Arnulfo Romero, the martyred archbishop of San Salvador was a true fiesta. While the actual canonization took place in Rome on Sunday, October 14, the celebration of the new saint in his home country was typically loud and colorful. Monte San Juan parishioners with their handpainted sign. We had four choirs from different villages who enlivened the march, another who led the music at Mass and yet another that kept people awake during the night—all with songs about Romero and other music that got people on their feet, clapping and interacting with each other. Maryknoll Lay Missioner Peg Vamosy (center) in front of the new Romero mural that a parish youth group painted on the side of the church. While there are countless Romero followers especially among the poor here, one of the great challenges today is convincing a still significant part of the Salvadoran population, including many within the church, of the truth about him. Assassinated while celebrating Mass by forces of the powerful ruling elite backed by the military of the 1970s and ’80s, Romero was appropriated by the left and his history was manipulated by both sides of the armed conflict that continued for the next 12 years.